Trophic match between producers and consumers — is food available when it is needed? NGA LTER research illuminates marine ecosystem responses to environmental variability. This includes how seasonal and decadal variability in nutrients, light, temperature, freshwater, and wind influences productivity and promotes ecosystem resilience. 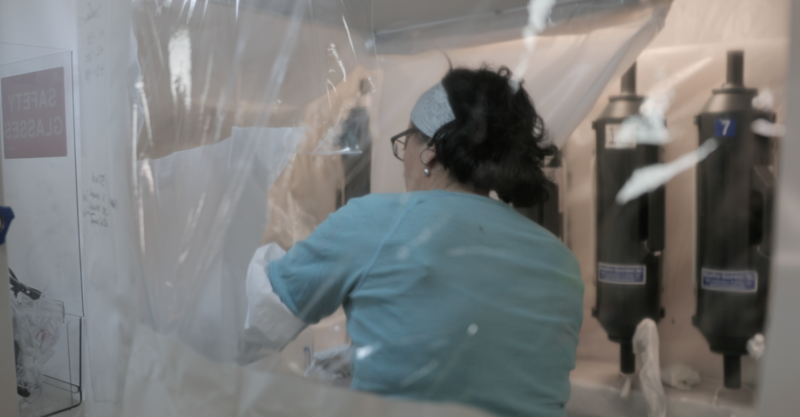 The NGA LTER hypotheses focus on how the physical environment influences the ecosystem’s structure, properties, resilience, and responses to variability. These hypotheses center on the characteristics arising from the NGA ecosystem as a whole—in other words, its emergent properties. Seasonal time series studies that address short- and long-term environmental and ecosystem variability through an observational program. 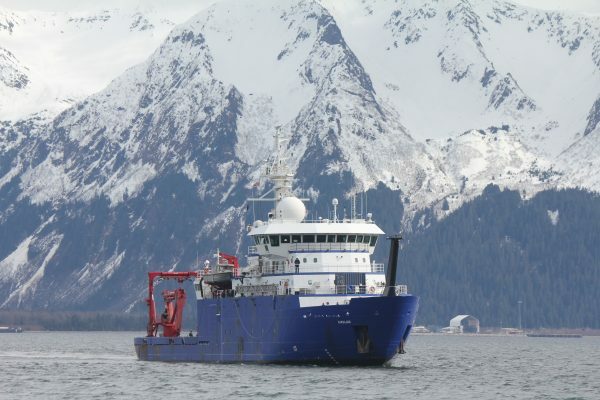 Spring-to-fall field cruises and year-round mooring-based measurements build on the existing Seward Line time series and leverage existing collaborations. Process studies that focus on mechanisms leading to variability and enhancement of NGA production. Physical and biogeochemical modeling studies that complement observations. These provide a framework both for testing hypotheses and for predicting ecosystem responses to environmental change. Data management components that provide a public platform for data visualization and synthesis by LTER colleagues, educators and students, and resource managers. In the NGA study area, the biological community is highly productive. The lower levels of the food chain (phytoplankton and zooplankton) support the iconic fish, crabs, seabirds, and marine mammals of Alaska. Large increases in phytoplankton during the spring and sustained production during the summer support zooplankton that transfer energy up the food chain. Substantial amounts of this organic matter also sink to feed animals on the sea bottom. 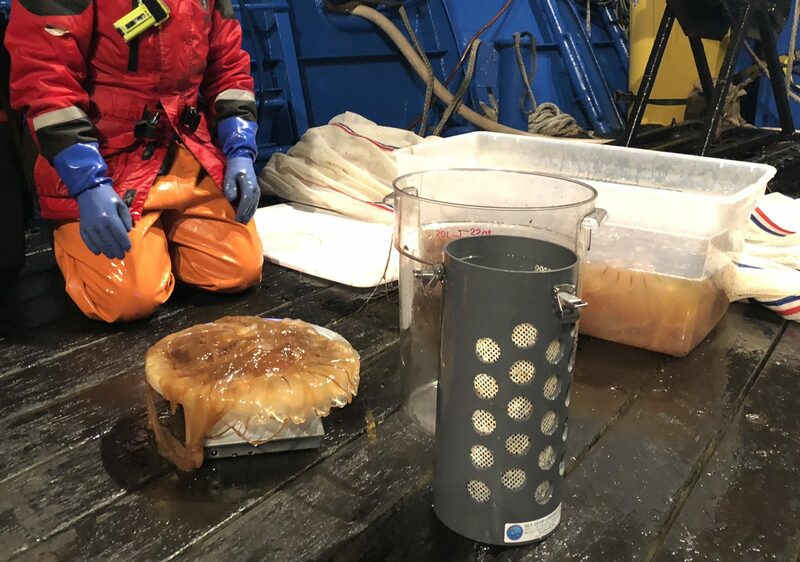 The central feature of the subarctic marine biome is strong seasonality of environmental drivers (heat, winds, freshwater input, and light) and salinity-dominated control of the water column stratification. While seasonality lends a quasi-predictable nature to the subarctic production cycle, a hallmark of this environment is marked variability in the timing and frequency of production events, as well as in the spatial expression of these events. Environmental variability over longer time scales also characterizes the subarctic biome, from multi-decadal fluctuations and trends to latitudinal excursions of the subarctic biome in conjunction with glacial retreats and advances. Thus the primary agents of disturbance in the NGA are weather events and progressive climate change. The deep (200-300 m) continental shelf of the NGA is bounded by steep, snow- and ice-clad coastal mountains inshore and a trench offshore, cross-cut by deep canyons, and linked to numerous complexes of fjords and sounds. Low pressure systems move through the region year-round, but are stronger and more frequent in winter. Associated winds drive the circulation of the Alaska Gyre, while winds plus runoff from the copious precipitation drive the coastally-confined Alaska Coastal Current. These current systems define a series of quasi-persistent cross-shelf habitats for plankton. Other mesoscale features important for planktonic production and distribution include river plumes, mesoscale eddies, and mixing zones (canyons, banks) associated with the large semi-diurnal tides. Regulation of primary production in the NGA is complex. Important roles are played by macronutrients (nitrogen, silicic acid), light, and grazing. 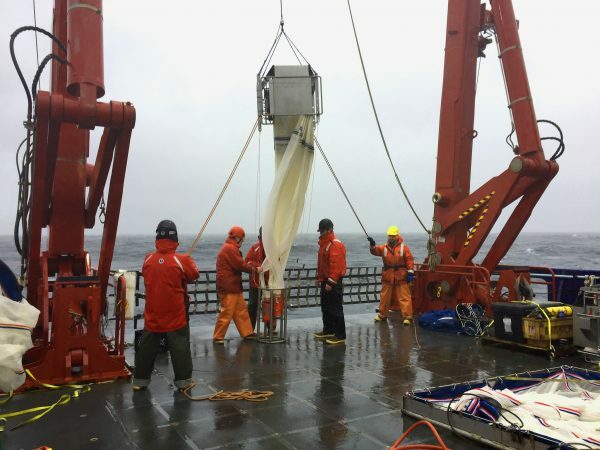 Production in the outer portion of the study region can be strongly limited by iron, a micronutrient whose availability dictates the ecosystem structure of the offshore (oceanic) Gulf of Alaska. Periods and locations of high primary production are generally associated with communities of chain diatoms, while nanoflagellates and picocyanobacteria are prevalent in most of the NGA in summer and fall. The fate of NGA primary production is poorly constrained, especially with respect to detrital pathways. Prior research indicates that grazing removal of primary production is primarily by protists (‘microzooplankton’), while larger zooplankton are key in transferring energy and biomass from the microbial to the vertebrate communities. 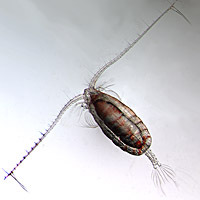 Large, lipid-rich copepods of the genus Neocalanus dominate the spring zooplankton biomass, and are important prey for higher trophic levels. Their long life cycle, with an over-wintering resting period coupled to early spring reproduction, couples production across years and may buffer the system against environmental variability. While numerous species of salmon are present in the NGA, fish communities are dominated by piscivorous demersal species, notably arrowtooth flounder, walleye pollock, Pacific cod, Pacific Ocean perch, and Pacific halibut. A range of other flatfish, rockfish, and shellfish (shrimp, crab) contribute to harvested communities, while lipid-rich forage fish (e.g., Pacific herring, capelin, sandlance, eulachon) are important trophic intermediaries for piscivorous fishes and seabirds. The predominance of demersal and benthic species at higher trophic levels suggests high rates of production exported to the benthos, at least seasonally. 1970: Oceanographic station GAK1 was established, with monthly sampling of temperature and salinity (via CTD) that continues to this day. 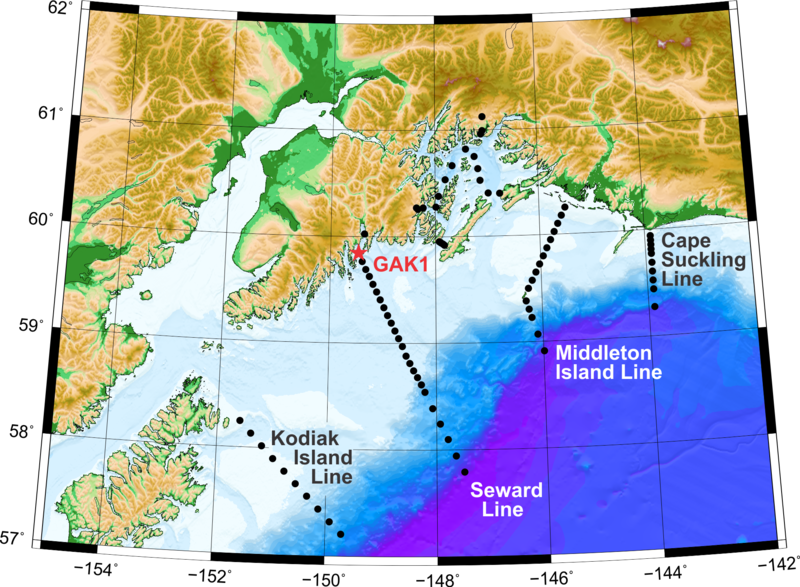 In the early 1970s, the Seward Line was established from GAK1 to past the continental shelf break, over 150 nautical miles. 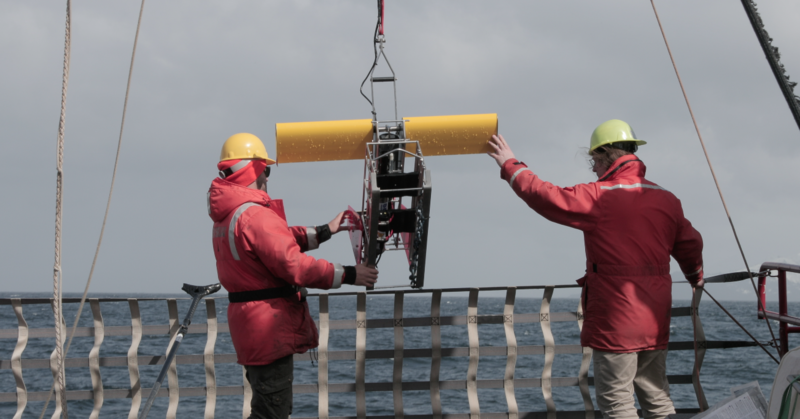 1997–2004: The US GLOBEC program (NSF/NOAA) supported intense observational and process studies of physics, chemistry, and biology, while EVOSTC funded the monthly CTD time series and consecutive moorings at GAK1. 2005: The North Pacific Research Board began funding a streamlined Seward Line program, with expanded observations supported by NPRB’s Integrated Ecosystem Research Program during 2011 and 2013. 2010–present: A consortium of NPRB, NOAA, and AOOS funds sampling. EVOSTC (through Gulf Watch Alaska) joined in 2012. 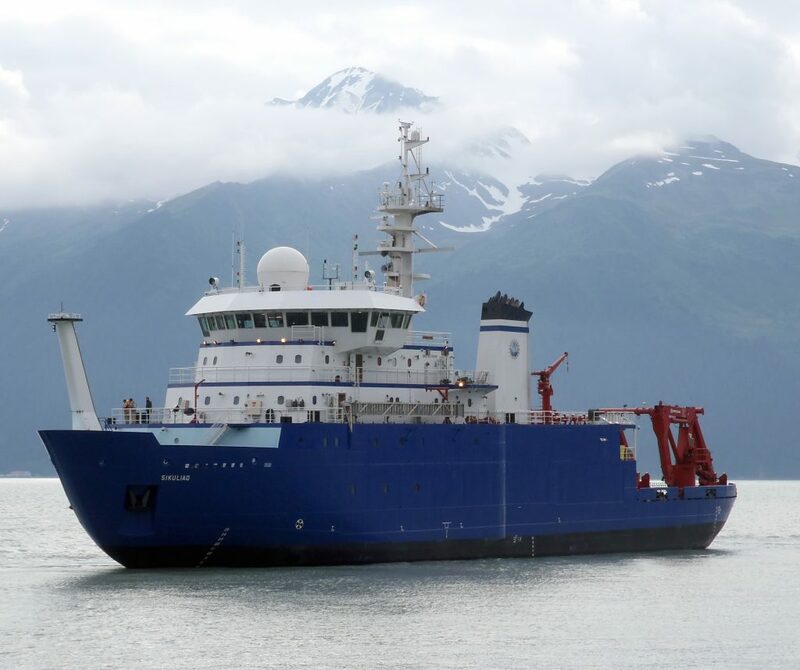 Each additional member of the funding consortium has expanded the Seward Line sampling effort. 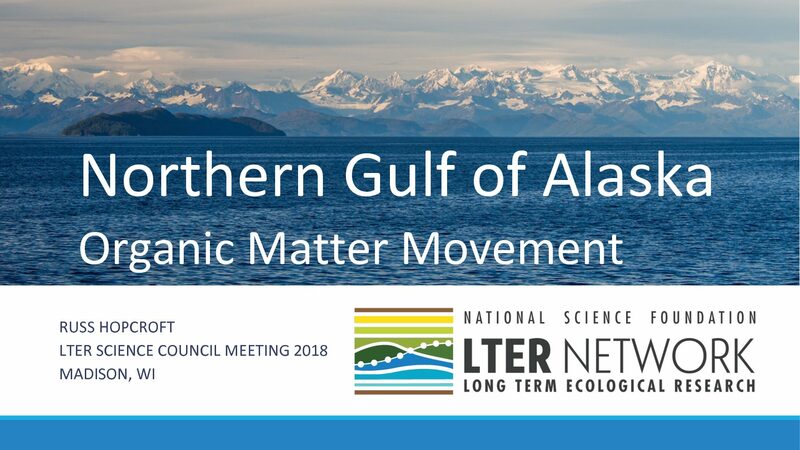 2017: The Seward Line program was selected by NSF as an important LTER site, representative of the ecosystem in the northern Gulf of Alaska.